This incredible 20 mile hike from the Jackson Glacier Overlook to Lake McDonald Lodge will leave you both exhausted and satisfied. 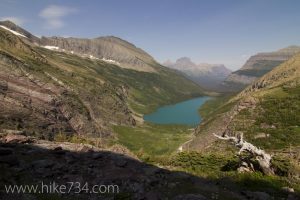 The first four miles of the hike are mostly in the trees as you drop into the valley from Jackson Glacier Overlook and begin to climb out of it by the Florence Falls junction. Once you gain some elevation, views of the peaks are all around you, as well as views of Gunsight Pass. After hiking for approximately 6.5 miles, you will arrive at Gunsight Lake, which is a great resting spot. At Gunsight Lake’s outlet, you will cross a bridge and begin hiking up switchbacks on Mt. Jackson’s north face. Here the terrain changes from dense avalanche foliage to rocky scree slopes. Keep an eye out for mountain goats and other alpine mammals from here to Sperry Chalet. The emerald-colored Gunsight Lake sits below, while waterfalls across the way cascade down the gnarled layers of rock on the southern slopes of Gunsight Mountain. Be prepared for a couple of late season snow crossings requiring appropriate gear such as an ice axe and crampons as you near the shelter cabin at Gunsight Pass. Once below Sperry Chalet, you are in for a fairly long downhill slog out to your car at the parking lot of Lake McDonald Lodge. Trailhead: Park at Jackson Glacier Overlook on Going-to-the-Sun Road.